Who needs another biennial? Los Angeles does, according to the Hammer Museum. The reason: ‘Simply put, the artists,’ says Hammer curator Anne Ellegood in her catalogue essay. While artists are undeniably thick on the ground in LA, not all are good. The curators of ‘Made in LA 2012’ – Ellegood and Ali Subotnick from the Hammer, joined by Lauri Firstenberg, Malik Gaines and Cesar Garcia from its ‘sister institution’, LAXART – set themselves the challenge of finding 60 biennial-worthy artists who are either emerging or under-recognized. These criteria allowed for the inclusion of several artists born in the 1980s alongside more established elders such as Channa Horwitz, now in her 80s. Aside from this corrective mission, the biennial declares itself to be themeless. Nevertheless, some identifiable threads run through the show. (Or shows. There are, in fact, three institutions housing work: the Hammer, LAXART and the LA Municipal Art Gallery.) Crafty, handmade, intimately scaled objects predominate – as seen in Roy Dowell’s painted papier-mâché totems, in Zach Harris’s psychedelic carved wood frames and in Zac Monday’s winsome crocheted monster costumes, worn by performers in the galleries. The corruption of fine art by craft techniques is no longer the radical strategy it once was; what emerges here instead – not necessarily uninterestingly – is the merging of art practice with personal choices about lifestyle and leisure. 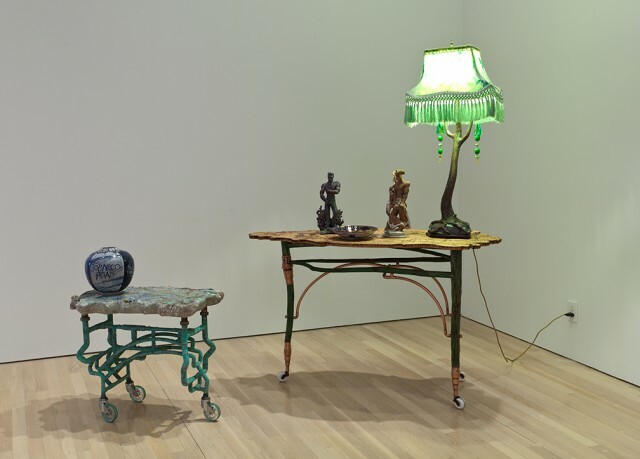 Some of the best work in the biennial is by Joel Otterson, whose table bearing butch ceramic figurines and a lamp describes a richly allusive queer domesticity (Tableau Vivant; Burned and Scarred, 2008–12). In the catalogue, the curators cite five watchwords that recurred in their notes: ‘archaeology, materiality, mythology, theatricality and subjectivity’. For better or worse, these are never made explicit in the exhibition itself, though they are hinted at through the placement of works – archaeology, for instance, through the installation of Liz Glynn’s project comparing items smuggled across the Gaza Strip with those found in pyramids at Giza next to Karthik Pandian’s Mad Men-inspired slide installation Carousel(2012), Erica Vogt’s installation of arrayed, indeterminately functional objects and Patricia Fernández’s taxonomies of inherited buttons and fabrics. The watchword ‘subjectivity’ benefits from a little unpacking. 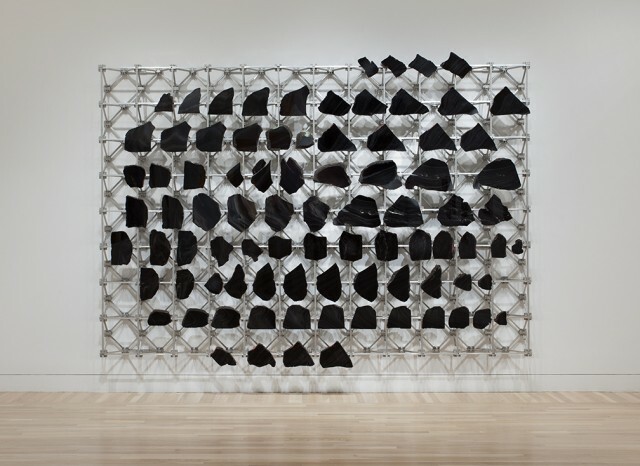 On the face of it, the term points to the multiplicity of perspectives that Los Angeles accommodates: Meleko Mokgosi and Nzuji de Magalhães both contribute paintings and sculptures that reflect, rather straightforwardly, on aspects of African culture; Nery Gabriel Lemus and Vincent Ramos both make work about their concerns as Latinos in California. Brutal Set (2012), a performance by Math Bass involving several of the artist’s friends, seemed mainly to do with subcultural cohesion and posturing. Zackary Drucker’s excellent film SHE GONE ROGUE (2012), in collaboration with Rhys Ernst, places Drucker in clichéd narrative situations that are subverted by queer and transgender performers, such as Vaginal Davis, appearing alongside the artist’s own family. There is another kind of subjectivity, however, that is unrelated to external social realities. The curators make a significant observation on contemporary Angeleno art by foregrounding artists who work with a particular self-absorption, even an apparent naiveté. This is not the reference-heavy, over-educated brand of conceptualism that has become internationally ubiquitous in recent years; instead, artists such as Ry Rocklen, Caroline Thomas, Sarah Cain, Rubi Neri and Scoli Acosta make objects and pictures that are mystical, sometimes seemingly mystified by themselves. The epithet I often reached for was ‘visionary’. The finest examples of this – Mark Hagen’s We’ve Seen the Future and We’re Not Going (2012), in which a modular aluminium structure holds sequential slices of polished black obsidian, and David Snyder’s cacophonous Me TV (2012), a crazy architectural façade cradling screens that blare with his self-performed television shows – though outwardly different, both captivate through their weird but highly evolved systems of interior logic. Another highlight is Goods Carrier (2012), a video installation by Vishal Jugdeo who used the biennial’s generous production budget to shoot a film with actors in Mumbai. While sculptural props shuttle automatically across the darkened gallery floor, Jugdeo’s actors perform naturalistic (though scripted) interactions that are entirely bereft of narrative context. Despite its eccentricity and exoticism, the work avoids the threatened narcissism of the subjective authorial position through its astuteness about the currents of globalised culture and its representation. Not all the work here is good. Considering that every curator supposedly agreed on every artist, too much seems complacent, limp and lacking in ambition. The problem, maybe, is that the biennial isn’t sure of its main purpose. Is ‘Made in LA 2012’ an experimental hatchery for nascent art practices? That would be no bad thing, and its intermittent quality would be forgivable. But also to boast – either to an international audience or to local citizens – about the calibre of art here seems hubristic. There is a prize (of US$100,000) for one artist, on whom all visitors can vote, but the exhibition isn’t particularly crowd-pleasing, and wall texts are impenetrable. This is not the best of all LA – far from it – but neither is it a focused analysis of a particular aspect of the city’s diverse art scene, as attempted by the Hammer’s previous series of ‘Invitationals’ (which the biennial replaces). A microcosm of the show is distilled in Slanguage’s ‘takeover’ of LAXART, which the collective (founded by Mario Ybarra Jr. and Karla Diaz) has filled to the brim with art works by themselves and by the young people who take part in their workshops in the harbour town of Wilmington. There is no sense of connoisseurship here; their motto seems to be ‘come one come all’. What is important to Ybarra and Diaz is establishing an authentic, autonomous language (hence the group’s name) that faithfully represents an existing local culture – but which, nevertheless, sometimes reveals surprising, unique visions. That is what ‘Made in LA 2012’ achieves, and perhaps that is all one should hope for. 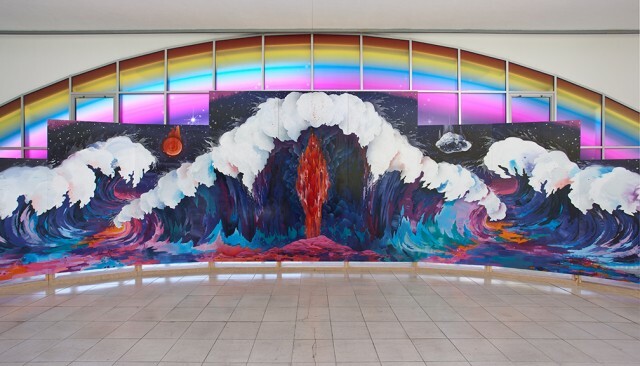 Tags: biennial : Hammer : LAXART : los angeles : Made in L.A.